Bluehost has become one of the most prestigious web hosting providers out there. For people in the web hosting industry, it is impossible to find a person who doesn’t know the name Bluehost. They are famous for providing a various form of web hosting service like Shared, Cloud, Dedicated, VPS etc. Not only that but also they are known for domain name registration service. Bluehost has added cloud hosting on their collection recently. Despite being a new hosting service, there has been an uprise on the interest about the cloud hosting service by Bluehost amongst webmasters. So, for this post, we have assembled plenty of information about Bluehost Cloud Hosting service and Bluehost itself. We can’t wait to share all of those with you. So, without further ado, let’s proceed. Cloud hosting is almost identical to VPS hosting. If you don’t know what a cloud hosting is, let’s clarify it for you. Cloud hosting is a new form of hosting service. In this form of hosting, the websites aren’t hosted on any particular physical server. Rather, the hosting provider will make one/more virtual server/s by connecting multiple physical servers through a network. Those virtual servers draw their needed computing resources from the physical servers. In reality, these servers are separated from one another by their own operating systems and control panel. They don’t have any physical existence as they are only available virtually. As a result of that, they are called cloud servers. However, as the cloud servers depend on multiple physical servers, there are plenty of benefits using a cloud hosting account. This type of web hosting is fully scalable and customizable. And, you will have the complete control over your account as it is separated from other users’ accounts. We will go into more detail about this in this post. The cloud Hosting plans of Bluehost are created in a way so that every kind of users can pick one for themselves. There are 3 cloud hosting packages of Bluehost. They are known by the names Starter, Performance, and Business Pro respectively. These packages are priced within an affordable price range. And, they pack a lot of features which could come in handy while you are hosting your website using any one of these packages. Now, let’s give a brief summary of those packages below. Do you have only one website to host? And, do you want the best performance from your only website? Then the ‘Starter’ package is the ideal deal for you. The only problem with this package is that it is only capable of hosting only one site per user. So, if you want to host multiple websites in your cloud hosting account, then this is not what you are looking for. But, it is surely a good place to start. So, if you want to get this package then you have to pay at least 6.95$/monthly. In exchange for that, you are receiving 100 GB SSD Storage, 2 GB RAM, Unmetered Bandwidth, 2 Cores CPU, and 50$ worth of marketing offers. There are also other valuable free features come with this package. We will talk about them later separately in this post. Now, if you want the best package for a reasonable price then you have to take a look at the ‘Performance’ Cloud Hosting Package. Due to its advanced features and affordability, it is now the most popular and officially recommended cloud hosting package on the Bluehost website. Apart from the reasonable price, it is popular because you can host unlimited websites using this package. People who have multiple websites they tend to go with this package. Plus, you are also getting Unmetered Storage, 4 GB RAM, Unmetered Bandwidth, 4 Core CPU, and 200$ worth of marketing offers. On top of these, there are also some other benefits of using this package. You have to spend at least 8.95$/monthly for this one. You can already see that it is the best package if you compare its price and specifications to the ‘Starter Package’. Do you own multiple high traffic websites and want to make them faster and stable? And, to do that you are ok with spending a bit much money. Then you have the ‘Business Pro’ option. This will be the perfect solution for users with multiple high-traffic sites. The price of this package is a bit higher than the other two. But at the same time, it is superior in every way compared to those plans. It will cost you from 15.95$ per month. And, you will have Unmetered Bandwidth, Unmetered SSD Storage Space, 6 GB RAM, 6 Core CPU, 200$ worth of additional marketing offers etc. And, you can also add as many websites as you want on your hosting account using this package. Additionally, this particular plan comes with some extra features which are not included with the previous two plans. They are free dedicated IP, free Domain Privacy, and free CodeGuard Basic add-on. 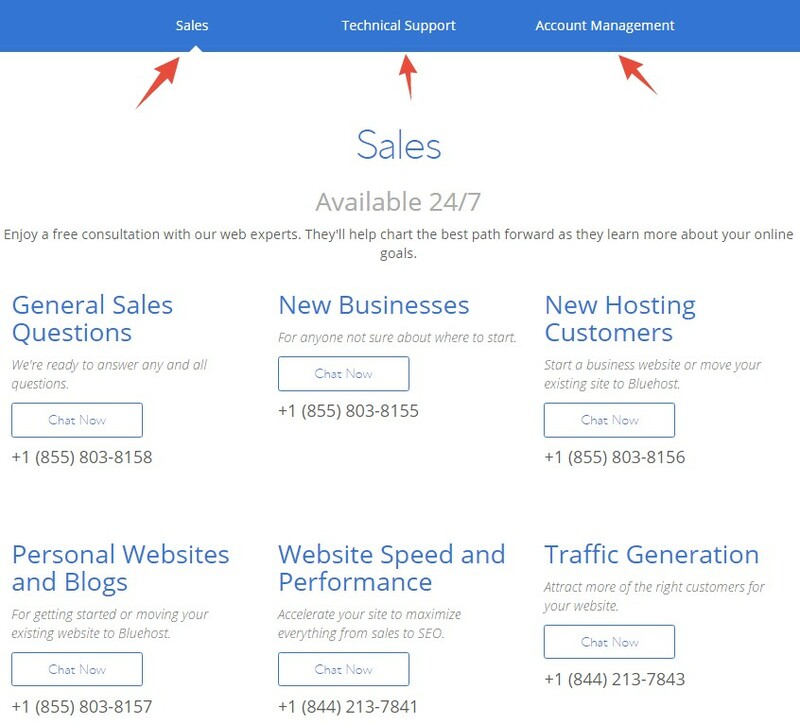 These extra features will take your websites to the next level. So, if you don’t have any issues paying a bit much money but want to have the best features and services, the ‘Business Pro’ package is the best option for you. You have to be very careful when choosing your next Bluehost cloud hosting package. As the prices we have mentioned above are discounted price. Bluehost offers these special prices for first-time buyers of their hosting packages. So, you should know that the renewal price won’t be similar to this. Rather, then the renewal price will be somewhat higher than this. Also, you can buy any cloud hosting plans for a minimum of 1 year to a maximum of 3 years. And, the discount is related to the length of your billing cycle. You have to buy for more years at once to get a better discount. Who should utilize Bluehost Cloud Hosting Plans? Cloud hosting service is a great way to take your website and business to a whole new level. There are a lot of website owners who are using a shared hosting package at this moment. But, we know you are not getting the best performance from your websites. Unfortunately, it is the way it is in the case of shared hosting. However, if you want to maximize your website’s performance by paying a bit of higher fee than your current ones, then cloud hosting is the way to go for you. 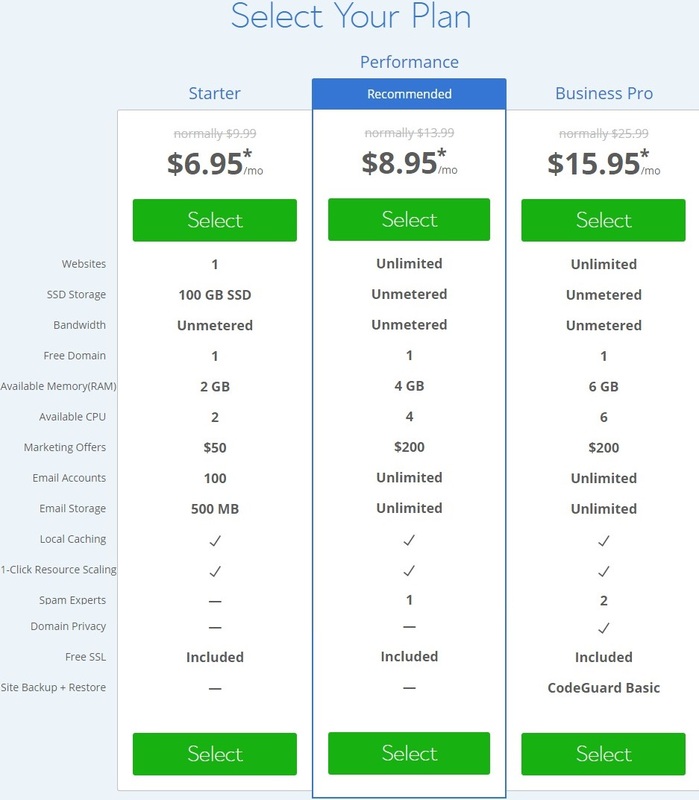 If you look at the Bluehost shared and cloud hosting plans, you will see that the price difference is negligible. So, why wouldn’t you take the advantage of using an advanced cloud hosting over a shared hosting service? Now, you could be new to this web hosting scenario. And it is probable that you are in a dilemma that whether it will be easy to use cloud hosting for you. Fear not. 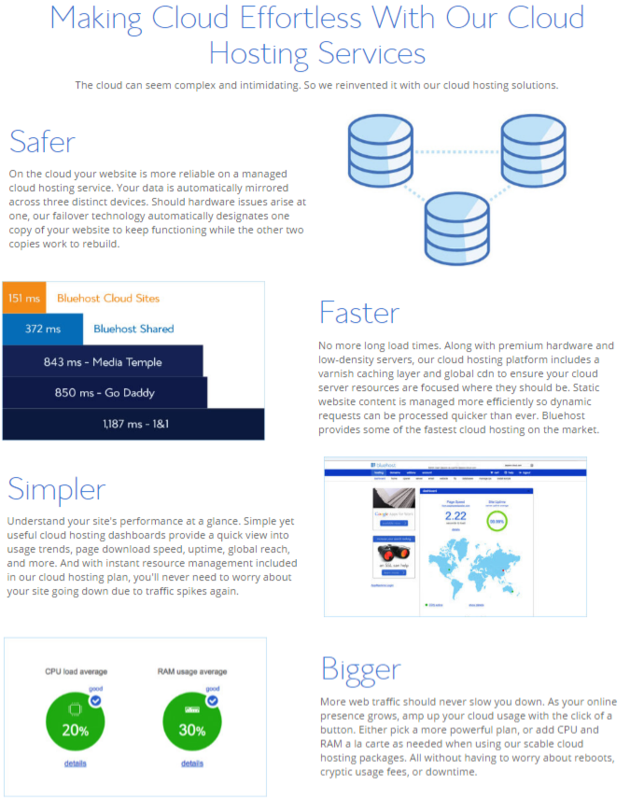 Bluehost has made their cloud hosting service very easy to use from the start to the finish. The accounts include some very user-friendly software and tools. So, you don’t have to be a web hosting professional to use Cloud hosting service of Bluehost. An interesting feature of cloud hosting is that you can add additional resources to your hosting account on the go. So, if you have a website which receives a spike in traffic on some particular time then you will love cloud hosting plans of Bluehost. It can be a lot of help if you are an owner of an online shop which might get a sudden increase in the number of visitors during a special time of the year like Christmas, Halloween, and Black Friday etc. Lastly, the cloud hosting servers of Bluehost are well secured and performs a lot faster than normal servers. So, for anyone who is looking for an improved performance on their websites, Bluehost Cloud hosting service can be a great pick. Great for hosting which web applications? An ideal web hosting company should be compatible with most of the popular web applications. There are plenty of different kinds of web applications available. Some of you might as well know them as CMS or Content Management System. CMSs are a vital part of any website. If you are not a coder or a web developer then you will have to depend heavily upon a CMS for producing your website contents. Thus, it is inevitable that your web hosting company should handle your favorite CMS or web application. Lucky for you, Bluehost supports almost all the web applications out there. Again, for users who love WordPress, there’s a good news. Bluehost has everything optimized for WordPress. They have special tools, plugins, and software for WordPress included with each cloud hosting account. As WordPress is the most used CMS in the world, Bluehost particularly supports it well. No need to be sad if you are not fond of WordPress, though. You can use every other popular CMS such as Drupal, Joomla, PrestaShop, Magento etc. without any problems at all. With the help of Bluehost auto-installer, anyone can install their favorite CMSs/scripts with just a few clicks. The auto-updater tool which is pre-installed within your cPanel can be a handy tool. This tool will automatically update your CMS to its latest version every time a new version is released. It will not only save your time but also you will be safe from a lot of hassles because of it. So, you should not have to worry about using any web applications with Bluehost Cloud hosting service. Bluehost integrates Cloudflare CDN with each cloud hosting account. A CDN service can be very useful to increase the speed of your websites. And, most importantly Cloudflare is free. Every cloud hosting account of Bluehost will have an easy to use dashboard where you will be able to see different kinds of data related to your website like uptime, global reach, usage trends etc. No matter how many websites/domain you add to your cloud hosting account, you will be getting free SSL certificate on all of those. It is one of the unique services of Bluehost. You can get a domain name from Bluehost for free for a period of 1 year. Didn’t find Bluehost cloud hosting service useful? No need to worry. You can get a full refund within the first 30 days from Bluehost. Each cloud hosting accounts and everything related to it like the servers, software, and hardware are constantly monitored by Bluehost. Also, every server-sided issues will be solved by Bluehost. As your cloud server depends on multiple physical servers, you are safe from any unexpected situation. If a problem occurs on one of the physical servers, your cloud server will switch to other servers (physical) to pull the power and resources required. All of your website’s contents will have 3 copies on 3 different devices. So, if one of them malfunctions, the others will be working on behalf. 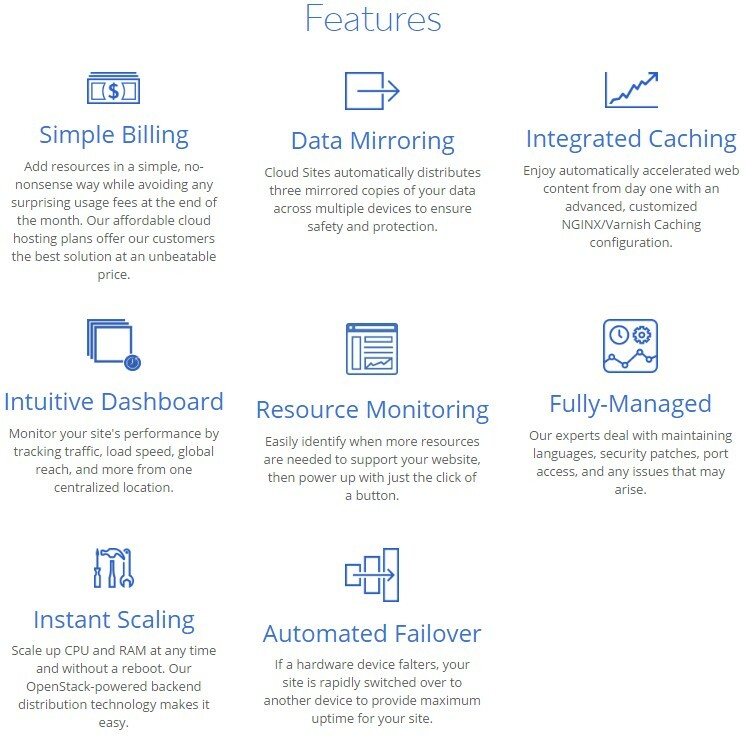 Bluehost offers their custom-developed caching plugin with each cloud hosting account. This plugin makes their customers’ websites much faster. One of the very useful features of Bluehost cloud hosting is that it is fully scalable. That means you can add/remove/configure the required resources for your website at any time. You can add CPU and RAM on your server without even having to reboot your server, which means you will face no downtime while managing the resources on the go. Your websites’ contents are the most important and valuable thing to you. So, you should make multiple back-ups of those. And, if it’s possible you should take backup on a scheduled time regularly. 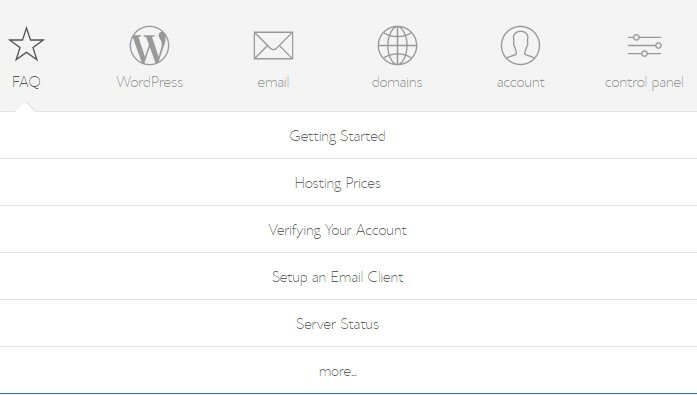 Bluehost integrates a backup tool with each of their cloud hosting accounts. That tool will take daily, weekly, and even monthly backup. So, if anything on your website gets damaged, you can restore it from the backup with just a few clicks. A lot of other features are also available with the cloud hosting packages of Bluehost. To explain each of them will take a lot of time. So, we are skipping many of them. Yet, you can know about them from Bluehost website if you want to. One of the most important criteria of a good web hosting is its fast and responsive servers. Without having fast servers, the websites hosted on any particular web hosting company will be intolerably slow. So, if you are interested in Bluehost, you should know if it has got fast servers or not. To find that out, there is a very easy way. You can test the load speed of any website which is hosted in Bluehost. How do you do that? You don’t have to. Because we have already done it. So, we will be sharing it with you now. You can use Pingdom’s speed test tool to perform this kind of test. As Pingdom is very powerful and has multiple servers to test from. Thus, we have also used them for our test. In particular, we used the San Francisco test server of Pingdom for running this test. Our aim was to find out the load time of our test website which is hosted on Bluehost. Consequently, we would be able to know if Bluehost is fast or not based on the result. On our test, the test subject has taken only 824 ms as its load time. The ‘Load Time’ means the amount of time it takes for a website to load completely on any visitor’s browser. To understand if this result was good or not, you have to consider this. The average website load speed time is around 2 seconds. And, it is typical that it’s undoubtedly better if your website loads faster than that. To put it simply, the lower the load time is the better the load speed. As you can see that this particular website hosted on Bluehost was very fast. The load time is even lower than 1 second. To be frank, we haven’t anticipated this good result. This result was possible because of the quality of servers of Bluehost. In the case of Cloud hosting service, your website will load even faster than this. So, you can be sure that Bluehost is reliable when it comes to faster load speed for any websites. Do you know the ‘real’ uptime stat of your future web hosting company? Most probably your answer will be a big YES. But, have you noticed that we asked you about ‘real’ uptime stat? Let’s make it simple. Currently, you have probably known about the uptime stat of your web hosting provider from their own website. There’s a little problem with that. 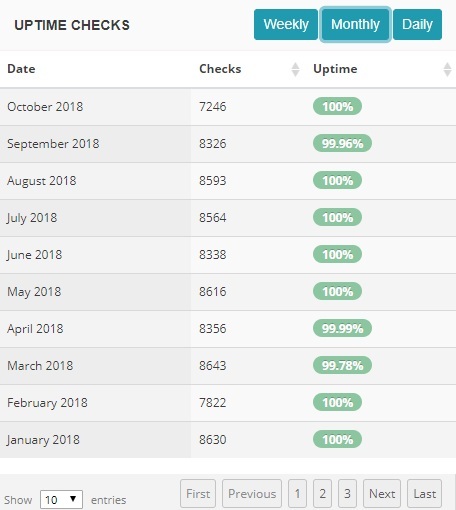 It is sad to say that not all of the web hosting providers tell you the truth about their uptime stat on their website. Rather, they do the opposite. They boast about a false statistic. This is another old-school marketing ploy. However, it might help them to acquire new customers but doesn’t help us in any way. So, you have to know about the ‘real’ uptime stat of your web hosting company utilizing a different method. To tackle all the problems, we have done the job for you. We think it’s the time to let you in on a secret. So, here we go. We have used a Bluehost hosting account to host one of our test sites. And, then we have started to keep track of the uptime and downtime status of that website rigorously. Although this method is costing us a bit of fortune, we are happy that we can let our readers know about the ‘real’ uptime stat of Bluehost. Let’s see the uptime record of Bluehost web hosting company. This is plain to see that the average uptime percentage of Bluehost is above 99%. As the industry-standard uptime is also 99%+, we can say that Bluehost is maintaining the standard uptime record. Except for that, we can see that Bluehost has maintained full 100% uptime on most of the months. This is an incredible feat, to say the least. It is also undeniable that Bluehost faced some downtime on a few instances. But overall, the performance was beyond our expectation. This was possible only because of Bluehost’s strong and adequate power sources and backups on their data center. If it was not the case, the uptime would be far worse as the data centers would go down from time to time due to inadequate power backup. A web hosting company can offer you the lowest price, faster servers or even some essential features for free. But, if they don’t have supportive and professional customer service then nobody will buy from them. If any issues arise on our hosting account, a support personnel from your web hosting account can assist you in the best way possible. So, it is indispensable for any web hosting company to have a helpful customer support team. Bluehost does know that and they have prepared ahead of time. You can contact their customer service team 24/7/365. And, you can talk about regarding any issues with them. They will help you out. You can find a few of the ways to communicate with them below. Our experience with Bluehost support was overwhelming. We talked with them on a few occasions. Whenever we have reached them, they were happy to help us. Even if you are not one of their current customers, you can contact them. There are a lot of positives about their customer support team. Among them, the most remarkable one is their response time. You don’t have to wait for even a single minute to get the first reply from them. And, then you will be provided with the best solution or suggestion depending on your issues or queries. Everything will happen so fast. Another thing is that the customer support staffs are the top experts in their own field. They know what they are doing. If you want to learn about web hosting/management in greater detail then you will love the support page of Bluehost. They have all kinds of helpful articles from how to, tips-tricks, reviews, instructions to user-guides on that page. They also have a separate FAQ section which contains most of the common issues and solutions related to web hosting. So, anyone can find the solutions to their problems even without contacting the customer service team of Bluehost. Every knowledge-based articles are sorted in specific categories. This is was done so that anyone can find the answer to any of their web hosting related questions within a prompt. You can also contact customer care based on specific problems. The contact page also contains a number of categories like ‘Sales, Technical Support, Account Management’ etc. We were very pleased the way Bluehost take care of their customers. So, we believe that you too will love their customer service as we do. Our Final Words: Should you choose Bluehost Cloud Hosting Service? You should definitely give it a try. It is obvious that Bluehost has intended their cloud hosting packages especially toward users who want better performance. Bluehost was very careful about pricing these packages. Every one of the cloud hosting packages is budget-friendly. So that people of all kinds can use this awesome service. A website owner should be very cautious about the security of his/her websites. And, it is a must to use a web hosting service which is equipped with all the necessary security tools. Fortunately, Bluehost is well prepared in this case. Added to that, we have also tested the speed of a website hosted on Bluehost and found out that Bluehost actually has faster servers. And, later we have also disclosed the original uptime record of Bluehost to you. From that, we have seen that Bluehost is capable of maintaining the 99%+ uptime. Along with that, we have also talked about their benevolent customer support team. Now, it is apparent that Bluehost ticks all the boxes of a top quality web hosting company. They have helpful customer service, fast servers, stunning uptime and inexpensive packages suitable for all types of users. And, from our own experience, we can only highly recommend Bluehost Cloud Hosting service to our readers. It is apparent that Bluehost ticks all the boxes of a top quality web hosting company. They have helpful customer service, fast servers, stunning uptime and inexpensive packages suitable for all types of users. And, from our own experience, we can only highly recommend Bluehost Cloud Hosting service to our readers.